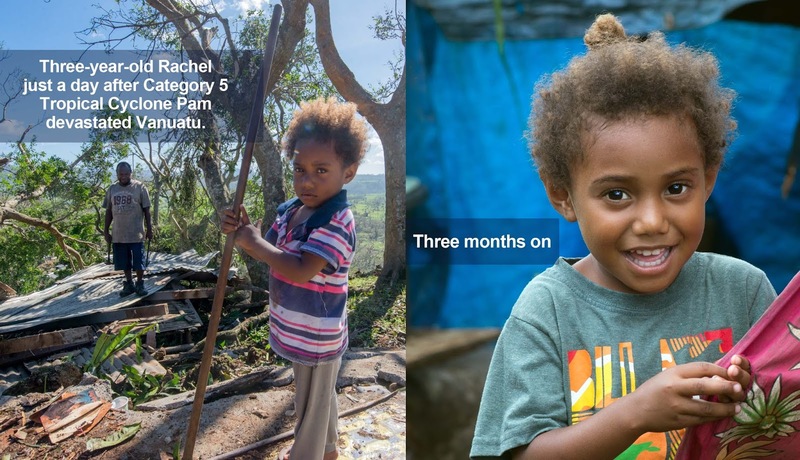 We first met three-year-old Rachel just a day after Category 5 Tropical Cyclone Pam devastated Vanuatu. Three months on, we go back to check in on her. Rachel’s world was turned upside down when Cyclone Pam slammed into Vanuatu late on Friday 13 March. At just three years of age she watched her house, and seven others, washed away by thousands of litres of water from the ruptured water tank at the top of the hill her house once sat on. When we went to visit her and her family the next day we met a child who was fearful and withdrawn. She wasn’t communicating, instead sweeping the bare concrete pad where her house had been, perhaps a child’s attempt to put things back the way they were before the cyclone. It was clear that Rachel wasn’t ok, and that full recovery was a long way away. When her father disappeared from sight for even a few seconds she immediately became profoundly distressed. We saw her again a week later and she was still withdrawn, refusing to talk or have her photo taken, a child’s choice that we will always respect. Three-year-old Rachel just a day after Category 5 Tropical Cyclone Pam devastated Vanuatu. Her stress was a normal reaction to an abnormal event, one that generally passes with time for most children – but three months on, we nonetheless went to find Rachel again with some trepidation, what if she was still badly affected? The difference could not have been greater. A completely different Rachel greeted us: a ball of energy, smiling, playing and happy to be photographed. A little shy at first like any toddler, she quickly started interacting with everyone. It was a relief to see her happy. Her small community on the outskirts of Port Vila is working hard to recover. Rachel’s father and other men have managed to build basic shelters for all seven families, using salvaged materials, scrap timber and metal sheets donated by a local NGO. It will be a long time before life is back to normal for Rachel’s community but it’s clear that they are determined to recover together. Rachel’s story is one of many. 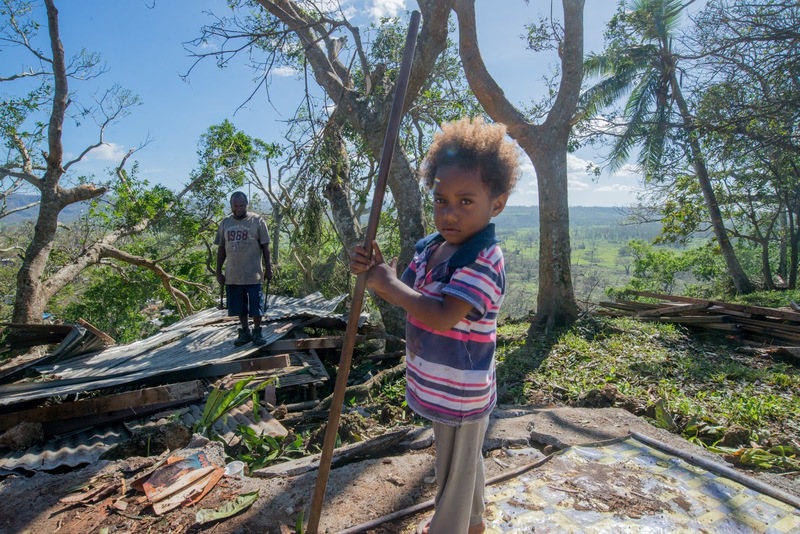 At least 82,000 children like her were affected by Cyclone Pam, which impacted homes, lives and livelihoods for more than half the country’s population. Even in the face of incredible stress and disruption, most children show incredible strength and resilience. Her community is still recovering from the cyclone, but Rachel’s smile is just one sign among many that things are on track. 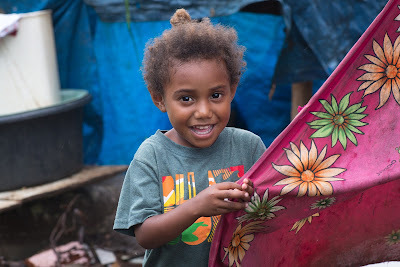 UNICEF is working with the Government of Vanuatu to support children and communities as they recover from Cyclone Pam. UNICEF has worked in partnership with the Government of Vanuatu for many years and is supporting affected children and communities to recover from the cyclone, also helping them to prepare for future challenges in one of the world’s most disaster-prone countries. In the three months since the cyclone, UNICEF has supplied safe drinking water to more than 46,000 people, and sanitation and hygiene supplies for nearly 70,000 people. Around 17,700 kindergarten and school-aged children have received learning materials and school supplies and more than 300 young children have received micro-nutrient powders to support their growth. More than 4,300 mothers of young children have been supported to ensure that their children receive healthy and nutritious food, and another 4,100 children have had damaged birth certificates reissued, or had their births registered for the first time.